will enable Oragroup to consolidate its growth. Lomé, October 19th, 2018 – Pan-African banking group Oragroup has officially announced the launch of its initial public offering on Abidjan’s Bourse régionale des valeurs mobilières (BRVM), having obtained the approval of the Regional Council on Investments and Financial Markets (CREPMF). This initial public offering – a “public offering of shares” – includes the issuance of 6,097,561 new shares through capital increase, as well as the sale of 7,785,445 existing shares on the secondary market, at a price of CFAF 4,100 per share, and thus consisting of a fundraising operation of CFAF 56.9 billion (86 million euros) in the regional market, making this the biggest IPO at the BRVM since its creation in 1998. The underwriting operated by the brokerage firms (SGI) will take place from October 29th to November 16th, with the possibility of an early closing in the event of oversubscription, for a listing of the shares in February 2019, subject to the BRVM’s validation. Following the operation, 20% of Oragroup’s equity will be listed on the stock exchange (floating capital). The Group’s other current shareholders will keep 80% of the capital, including pan-African investor Emerging Capital Partners (ECP), which will remain the majority shareholder with over 50% of shares. “By jointly carrying out a capital increase and a sale of shares to Abidjan’s Bourse régionale des valeurs mobilières(BRVM), Oragroup and its shareholders confirm the bank’s regional presence, actively contribute to the development of the regional financial market and increase Oragroup's resources to increase funding of the private sector through market channels,” explained Vincent Le Guennou, Chairman of the Board of Oragroup and Co-CEO of Emerging Capital Partners. 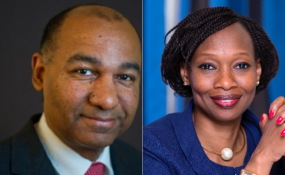 “This capital increase will enable us to consolidate the group’s growth and support its development, including by making investments in digital banking, seizing growth opportunities in Central African countries, raising the group’s profile among the financial community and the general public and strengthen the equity of some subsidiaries,” added Binta Touré Ndoye, CEO of Oragroup. At the end of 2017, Oragroup had a balance sheet total of CFAF 1,794 billion (2.72 billion euros), representing a growth of 45 % since 2014. Deposits from customers throughout the Orabank network amounted to CFAF 1,179 billion (+42% over the same period) and credit operations to CFAF 1,085 billion (+38%). In total, the Group posted a net banking income of CFAF 108 billion (164 million euros, +33 %) and net income up sharply by 45% year-on-year, and 205 % since 2014 at CFAF 21.97 billion (33 million euros). This profitability has given rise to dividend payments. 2017 was also marked by the success of the issuance of commercial paper totalling CFAF 35 billion (53.3 million euros) per public offering on the West African Economic and Monetary Union (WAEMU)’s financial market. In 10 years, Oragroup’s growth trajectory has been exemplary. The Orabank network has grown from having a presence in five countries in West and Central Africa to a pan-African dimension with subsidiaries in 12 countries, spread across four currency areas. After having been the "best regional bank in West Africa" in 2015 and 2017 (African Banker Awards), in May 2018, Oragroup obtained the Bloomfield agency’s A long-term investment and A2 short-term investment ratings, thus showcasing the strength and performance of the Group. As a part of its development strategy, Oragroup wants to be in the top 5 best-performing banks in each country in which the group is present, with an average growth of 18.3% of its net banking income between 2017 and 2022 and an operating coefficient below 50%. In addition, Oragroup is planning for an annual increase of 5% of the dividends paid to its shareholders. “For all of these reasons, Oragroup is a market opportunity for institutional and individual investors seeking medium and long-term investments that are strategic, profitable and have strong growth prospects,” concluded Binta Touré Ndoye. Oragroup is present in 12 countries across West and Central Africa (Benin, Burkina Faso, Côte d’Ivoire, Gabon, Guinea Conakry, Guinea Bissau, Mali, Mauritania, Niger, Senegal, Chad, Togo) and in four Monetary Union areas (WAEMU, CEMAC, Guinea Conakry, Mauritania). With 139 bank branches and 1,811 employees, Oragroup proposes to its 430,000 customers (governments, institutions, NGOs, large national and international companies, SMEs and private individuals) a wide range of banking products and services based on proximity and responsiveness. Working towards financial inclusion through the deployment of innovative solutions, Oragroup is also focusing on the less banked segments of the population. This commitment is reflected in its CSR approach, which is an integral part of its strategy and is a priority of its governing bodies, focused on energy transition, the management of social and environmental risks, and the well-being of the general public and its employees. For more information, please consult www.orabank.netor follow us on LinkedIn, @GroupeOrabank on Twitter, Facebook, Instagram, Google+, You Tube.